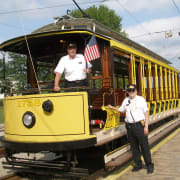 Operate trolleys on the museum's trolley line! Opportunities to conduct guided tours to the public. Training, uniform, certification, and museum membership required. New Operator of Training offered as a 4 day, weekend course in the fall and spring. Contact the museum for more information. Must possess a valid Driver's License, be/become a member of the museum, submit PA Clearances, be a minimum age of 18 years or older.